Enkianthus is a genus of about 10 species of mainly deciduous shrubs occurring in woodland from the Himalayas to Japan. Enkianthus campanulatus is the species primarily used for bonsai cultivation, growing to around 5 metres in its native habitat. E. campanulatas has opposite dull green leaves up to 6cm long that turn to vivid orange-yellow and then red in the Autumn. It is especially favoured for its racemes of between 5-15 bell-shaped creamy-yellow flowers which appear in late Spring and early Summer. There are two commonly available varieties; 'albiflorus' which carries white flowers and 'Hiraethlyn' which has cream flowers with dark-red veins. 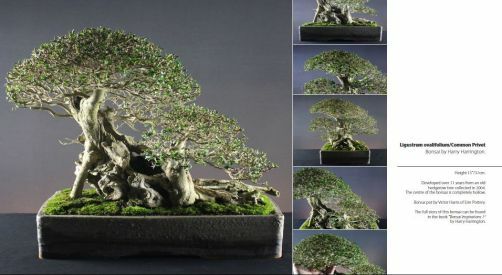 There are other Enkianthus species that have bonsai potential; E. perulatus is more compact and has smaller leaves so is more suitable for smaller sized bonsai. E. cernus var.rubens has slightly toothed leaves up to 5cm long that turn a dark purple-red in Autumn, it carries rich red flowers. Enkianthus are lime-hating (as with Rhododendrons and Azaleas) and lime/alkaline soils should be avoided. POSITION Full sun in Spring and Autumn, slight shade in summer. Frost hardy to at least -5°C. FEEDING Feed a balanced feed fortnightly after flowering, occasional replacement feed with an ericaceous fertiliser is necessary and will balance out the soil PH. REPOTTING Annually in spring as buds extend, use a standard mix but ensure that any grit or stone used as part of the soil mix is well washed to ensure the removal of any lime. PRUNING Trim back new shoots to shape through the growing season after flowering has finished. Hard pruning can be carried out after flowering. Large scars are slow to heal. PROPAGATION Sow seed at 18-21°C in late winter or early spring. Take semi-ripe cuttings in summer. Air-layer in late Spring or ground-layer in Autumn for removal the following Spring. PESTS AND DISEASES Trouble free though yellowing leaves can indicate chlorosis due to the presence of lime. STYLES Informal upright forms with single or multiple trunks in small to large sizes.